With the release of the Valancourt edition of Richard Marsh’s The Goddess: A Demon, I thought I’d repost my earlier review of the book, with some modifications specific to this edition. I’ve read a lot of the books of Richard Marsh (1857-1915) over the past few years, and have yet to be disappointed in his work. Marsh’s breakthrough work was The Beetle (1897), and he produced many other clever and atmospheric tales of weird fiction, including the bizarre horror tale The Joss (1901) and the silly social commentary The Magnetic Girl (1903). Sadly, most of these books were forgotten and neglected early in the 20th century. The story starts with a game of cards between narrator and protagonist John Ferguson and his neighbor and supposed friend Edwin Lawrence. Ferguson has a bit too much to drink, loses all of his money, and goes to bed suspecting that his friend had in fact cheated during the game. That evening, Ferguson has a dream in which he visits Lawrence’s room. He arrives to the sound of inhuman screeching and snarling, combined with the sounds of pain and terror, and when he opens the door, he finds Lawrence struggling in the grip of a strange, flailing creature dressed in robes and laughing with a women’s voice. Ferguson awakes in his own bed, and discovers that a woman has climbed in through his window. She is stunningly beautiful, suffering from amnesia – and covered in blood. Ferguson quickly finds that Lawrence has been brutally murdered – stabbed with perhaps fifty different blades – and the prime suspect is the beautiful mysterious woman in his care. The story is an interesting cross between horror and murder mystery. Much of the later development of the book centers around Ferguson’s simultaneous attempts to discover the killer and protect the woman he has immediately fallen in love with. As Ferguson himself is a somewhat straightforward man-of-action, even a brute, many of his attempts end up failing miserably! Readers searching for the multiple, intricate narratives of Marsh’s earlier work The Beetle and later work The Joss will be disappointed: Ferguson is the sole narrator of the tale, and it proceeds in a much more linear fashion. The story is more of a straight murder mystery than its counterparts, and the horror aspects only make an appearance at the very beginning and end of the tale. The characters, though, are quite well developed, from Ferguson to the mysterious lady to the suspicious police inspector Symonds. Like its counterparts, however, it involves a threat which comes from an exotic locale (India, in this case), though the threat manifests in a very different form than the other tales. The ending is paradoxically both satisfying and a little disappointing, though I liked it better than the somewhat contrived ending of The Beetle. It’s worth mentioning that there is a fair amount of humor in the tale, especially in the crude stonewalling that Ferguson undertakes against the police investigators! This humor talent is much more apparent in his later book, The Magnetic Girl. The Valancourt edition includes a very readable and enlightening introduction by Minna Vuohelainen, scholar of Richard Marsh. In it, one learns about Marsh’s somewhat colorful background, including his imprisonment for financial fraud! Vuohelainen puts Marsh’s history in context and shows how it likely influenced his writing. Also, London was a city going through very many cultural changes and tumultuous events in Marsh’s time (including the 1888 Ripper murders), and the introduction describes how events of the time were reflected in the events and issues raised in the book. 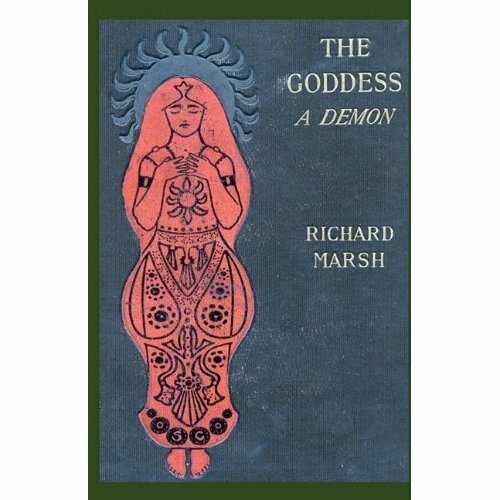 Fans of classic horror and mystery tales should definitely take a look at the work of Richard Marsh, and The Goddess: A Demon is a great representative of his oeuvre. Good job. The introduction and appendices by Minna Vuohelainen are worth the price of admission. For more raw, though complete, Marsh reprints, check out the British Library facsimile editions on sale via amazon.com. I greatly enjoyed The Crime and the Criminal.